Vladimir Prosikhin’s Team Nika won both the RC44 2015 World Championships and the season tour, a feat that has never been accomplished by any other boat. One season ago, Team Nika was struggling mid-fleet. Now Prosikhin is the 2015 Russian Sailor of the Year by Yacht Russia magazine and the Russian Yachting Federation. Here’s how he did it. Team Nika takes the 2015 class title! Virgin Gorda Cup – photo by Martinez Studio. 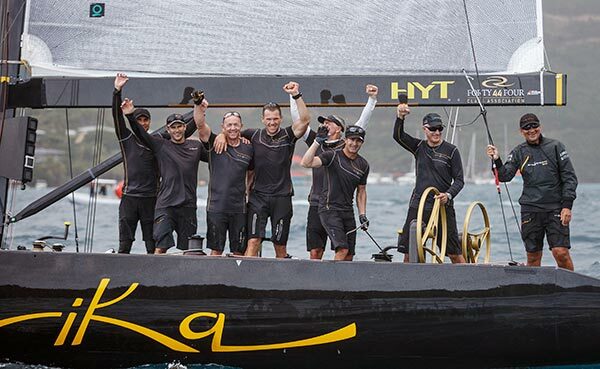 Vladimir Prosikhin’s Team Nika became the first RC44 boat in the history of the fleet to win both the season title and the World Championships in the same year when he sealed the deal this past October at the Virgin Gorda Cup. Prosikhin is relatively new to premiere one design racing having only joined the fleet five years ago and struggled mid-fleet despite strengthening his crew and learning the challenges of competing in such a competitive grand prix fleet. Now, as the World Champion, he says the secret to this season’s success is in his new Quantum sails and their speed experts. The RC44 was designed in Slovenia by five-time America’s Cup winner Russell Coutts and naval architect Andrej Justin. The fleet is unique in that all the boats travel together from race to race, on a 40-foot flat rack organized by the class association. This simplifies logistics for a series that moves from Sweden to Malta to the BVIs as well as keeps the costs down for the owners. Despite teams having almost exclusively North Sails inventories, Quantum-powered teams have had great success in the RC44 class fleet racing, including high ranking Aqua and Valentin Zavadnikov’s Synergy, which has also won the match racing season title multiple times. Their performance gave the class confidence to use Quantum Sails for the class heavy weather and match racing spinnaker which was designed by Quantum's Brett Jones. Prosikhin was unhappy with Team Nika’s performance and overall standings. Wanting a change, he made the decision to move from North Sails to Quantum, picking up Quantum sail designer Brett Jones as head coach. Jones coached Team Aqua for several years winning a number of season and world titles. Now with a full Quantum setup and a sail designer as coach, Team Nika is in a class by itself. The RC44 may be a one-design class, but Prosikhin says the fine-tuning of the sails is where you find the speed, and that is in large part thanks to Jones, a sentiment that is echoed by the Team Nika crew. Reinforcing Quantum’s goal to not only have the best sails, but also the best support behind them. “The experience of working with the designer is the number priority, and the number one thing that counted toward our success,” says mainsail trimmer Tomaz Copi. Dean Barker was originally signed on to serve as tactician this season, but scheduling conflicts resulted in Team Nika sailing with three different tacticians over the five regattas, which is unheard of at this level of sailing. Ed Baird sailed the final regatta in Virgin Gorda. Not to diminish the contribution of the tactician or the challenge of constantly changing the guy in the position, but Prosikhin says when you have boat speed, tactics are easy. Baird agrees. “The sails are great quality, but it’s not just that. There’s a network of support around and behind the product that helps to not only set the boat up correctly and get the sails looking good on the rig, but also working with the team on coordinating the sail trim and boat handling to make us the strongest on the water as possible,” says Baird. “We were definitely the fastest boat there by a lot, especially at the World Championships, no one could touch us,” Clarkson adds. The season standings were decided in the last seconds of the final race in Virgin Gorda. Heading into the final race, Prosikhin’s close friend and rival Vladimir Liubomirov’s Bronenosec Sailing Team needed only to finish ahead of Team Nika with one boat finishing between them. Instead, they ended up tied on the leaderboard, and Team Nika winning in the tiebreaker to win the season. “In a fleet of very strong one design boats, 0.5% difference in speed in most cases is everything,” says Prosikhin. Prosikhin was recently named 2015 Russian Sailor of the Year by Yacht Russia magazine and the Russian Yachting Federation and he’s also been nominated for Sailor of the Year in Monaco, too. The 2016 season looks bright for Team Nika. Baird has signed on and Jones will be back as head coach, along with most if not all of the crew. “Now we’re the target; everyone wants to beat us,” Prosikhin laughs. It’s not a bad position to be in.